To current Connecticut residents, Wilbur Cross is known for a landscaped parkway and for a building on the University of Connecticut's Storrs campus, both of which bear his name. Govenor Wilbur L. Cross signs the bill that made Connecticut Agricultural College the Connecticut State College. CSC would become the University of Connecticut in 1939, the year Cross left office. 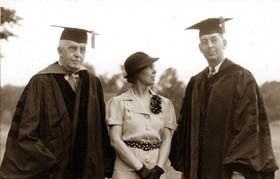 Governor Cross, left, recommended Albert N. Jorgensen, right, as the new president of Connecticut State College in 1935. They are seen here in June 1936 with Harriet Jorgensen after Albert's inauguration. Older residents of the state know him for the eloquent Thanksgiving Proclamation he issued as governor of the state in 1936 and which many generations of school children either heard read in class or were required to memorize. Cross, a four-term governor of Connecticut, was born in 1862, in the Gurleyville section of Mansfield. After graduating from high school in nearby Willimantic, Cross attended Yale, earning his bachelor's degree in 1885 and a doctoral degree in the new discipline of English literature in 1889. Cross joined the Yale faculty in 1894, and from 1916 to 1930 was the first dean of the Yale graduate school. He was well known as a literary critic and served as editor of the Yale Review for almost 30 years. He also wrote The Life and Times of Laurence Sterne (1909), The History of Henry Fielding (1918), and several books on the English novel. After retiring from Yale in 1930, Cross turned to politics, and was elected to four two-year terms. During his tenure, he was credited with much reform legislation, particularly relating to the abolition of child labor; governmental reorganization; and improved factory laws. 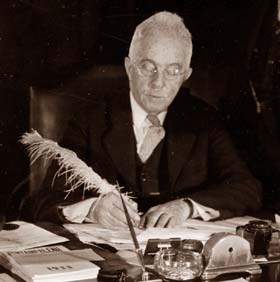 He took an active interest in the fledgling Connecticut Agricultural College, which became Connecticut State College in 1933, and would become the University of Connecticut in 1939, the year he left office. Cross recommended Albert N. Jorgensen to become president of Connecticut State College in 1935. And he supported Jorgensen's request to the legislature in 1937 that resulted in a $2.7 million bond authorization to rebuild the college. Included in the funding was an appropriation for building the first campus library. Opened in 1939, it was named for Cross during a building dedication ceremony in 1942. Defeated in his campaign for a fifth term as governor, Cross retired. His autobiography, Connecticut Yankee, was published in 1943. He died on Oct. 5, 1948, at the age of 86. Information on Gov. Cross was supplied by Fred Cazel, professor emeritus of history. Time out of mind at this turn of the seasons when the hardy oak leaves rustle in the wind and the frost gives a tang to the air and the dusk falls early and the friendly evenings lengthen under the heel of Orion, it has seemed good to our people to join together in praising the Creator and Preserver, who has brought us by a way that we did not know to the end of another year. In observance of this custom, I appoint Thursday, the 26th of November, as a day of Public Thanksgiving for the blessings that have been our common lot and have placed our beloved state with the favored regions of earth---for all the creature comforts: the yield of the soil that has fed us and the richer yield from labor of every kind that has sustained our lives---and for all those things, as dear as breath to the body, that quicken our faith in our humanity, that nourish and strengthen our words and acts; for honor held above price; for steadfast courage and zeal in the long, long search after truth; for liberty and for justice freely granted by each to each other and so as freely enjoyed; and for the crowning glory and mercy of peace upon our land --- that we may humbly take heart of these blessings as we gather once again with solemn and festive rites to our Harvest Home.